Bronco, I’m pleased to say, are catering for my needs as a modeller of British subjects very nicely. I am particularly pleased to see they are starting to provide crew sets for their growing range of artillery pieces and this set is a very welcome addition to the growing selection of plastic 1/35 scale figures that are finally starting to arrive on the shelves. The set (CB35087) provides 5 gun crew members for their recently released 17pdr Anti Tank Gun Mk I (CB35024) that was reviewed here on site by Patrick Selitrenny. The set comes packed in a nice box depicting the product detail and a representation box art of the finished figures. On the back of the box are the build instructions and a painting guide, plus a layout of the trees. 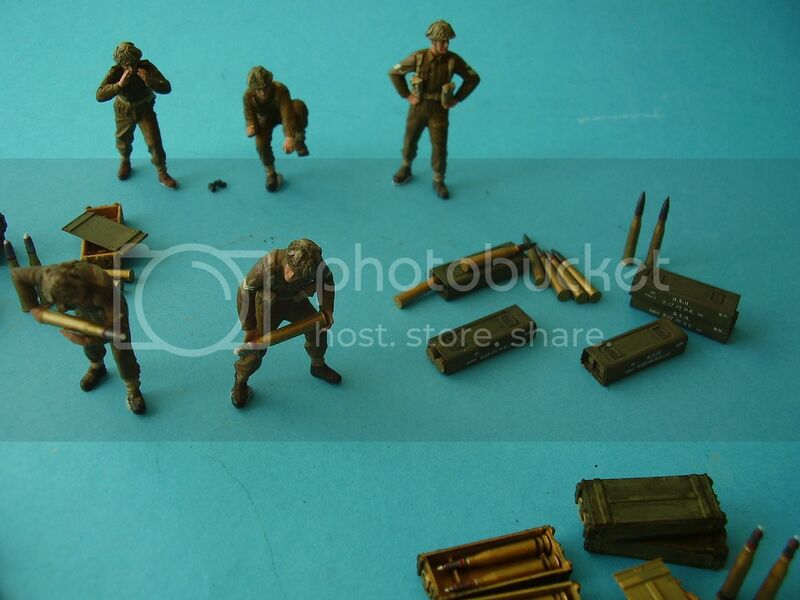 The box contains 3 trees of sand coloured parts, one tree contains the five individual figure parts, the second holds one set of the Bronco British Equipment and the third a small tree containing the double clip ammo pouches. Also included is a set of uniform decals...and in my case the bill for the cost! All 5 figures are dressed in Battle Dress Serge 39/40 the blouse having the pleated pockets. All, less the Officer/Senior NCO, are wearing skeleton webbing of 37 pattern belt and shoulder straps. The Officer/Senior NCO has the 37 pattern belt only. All the figures are of standard make up; separate legs, body arms and head and helmet. The 37 pattern belts are moulded to the upper torso so there is good detail on the brasses and rear buckles on the belts. All the uniforms have the correct arrangement of pockets and all are wearing a nice set of anklets and ammo boots. Figure A depicts a standing soldier, hands on hips with the left leg forward. The arms for figure A are actually on part of the B tree. The figure is of simple construction, the uniform and kit are as detailed above and the uniform has nice folds and creases. The figure needs minimal clean up, there are some small seams as you would expect with plastic injection figures but these are not really an issue. The figure has a Mk II un-scrimmed helmet and you will need to add the double clip ammo pouches . This depicts a standing Officer/Senior NCO leaning slightly forward on the left leg and looking through a pair of binoculars. Again the figure has nice detail. Uniform detail as above and to that you can add a pistol holster provided on the equipment tree and a binoculars case that is provided on the figure tree. You get two sets of arms with this figure and two sets of binoculars. One set of arms has the hands moulded on to which you can add an individual pair of binoculars and the other come with the binoculars moulded to the hands and these are then attached to the arms. This figure is also provided with a Mk II unscrimmed helmet. This figure depicts one of the loaders for the 17pdr gun. The figure is in the standing position, legs apart and slightly bent forward. The arms are designed to hold a 17pdr shell at about thigh height. Uniform is as above and to this you can add some of the ammo clip pouches if you desire, (more later). The figure has a mark II scrimmed helmet and overall has fairly good detail. The left hand is a separate Item on this figure. This figure depicts a soldier in the act of loading the 17pdr. Again in a standing position leaning to the left , the arms are designed to cradle one of the 17pdr shells. The left hand is a separate item on this figure. Also with a Mk II scrimmed helmet you would need to add some ammo pouches also. This is the seated gunner to go on the 17pdr kit. Details are as above, with the exception that you probably won’t need to add any ammo pouches as the figure is bent forward in the seated position. Helmet as per figure C & D.
Each figure comes with a separate head with good facial detail, the chin straps are moulded to the face and each has an individual helmet as detailed above. As mentioned above you get a small tree containing the additional ammo pouches. Bronco have provided these as individual clip pouches total = 10 in number. Up to 1943 double clip ammo pouches were worn by corps troops and non fighting units. This means that to depict the double ammo pouch you would need 4 per figure a total of 20 or given that one figure has a pistol and on the seated gunner you could use none or get away with one per side you would still need 12 for the remaining 3 figures. In reality you only have enough to properly equip 2 standing troops. So another small tree in the set would be very appropriate. As a bonus you get a tree of the already issued Bronco British Equipment. This contains a nice set of 2 x Vickers K guns and magazines for same, 4 x Bren pouches, a pistol holster, 2 x Mk II helmets, 2 x small haversack packs, 2 x water bottles, 2 x small digging tools, a Sten gun with alternative metal butts, a .45 Thompson MG with Drum Magazine, a rolled poncho, a Bren Gun with either open or closed bipod, 2 x No 4 rifles and a No 19 radio set. This tree sells on its own at what I always thought was a slightly expensive price so it added good value to the figure set. I’m not that keen on the pistol holster which looks a little large, and the Bren pouches and haversacks look a bit to square and featureless, but the remainder of the tree has some pretty handy stuff. You get one small sheet of uniform decals, for troops of the 50th Infantry Division, this includes 6 shoulder flashed, 6 x divisional badges, one set of chevrons for a Sergeant, Corporal and Lance Corporal. Unfortunately this means you only have uniform markings for one side of the Battle Dress Blouse, a slight oversight on Bronco’s part. This set is a welcome addition to the range of 1/35 scale British/Commonwealth plastic figures. It is, I believe, the 1st set of troops Bronco have issued and there is a lot they are to be congratulated on. The figures provide a decent gun crew for their 17pdr Anti Tank Gun and could be adapted and used elsewhere by modellers. Over all they have got the uniform detail well depicted, several of the large map pockets on the left legs could have had better detail and all the figures have closed BD necks on the blouses which was rarely the case when soldiers were in action. The body proportions, height (44mm heel to shoulder approx), and stance of the figures seems quite natural. The heads have good individual facial detail and they have included variety in the individual helmets My only observation here is that they tend to have flattish backsides, not a problem if you are adding the small digging tool, but you may wish to add some flesh to this region if depicting them without digging tools. The additional tree of equipment is definitely a plus but they seem to have miscalculated the required number of individual ammo pouches and uniform markings which may causes a few issues and annoy people. It should also be noted that no 17pdr shells are included with the set. Overall a well sculpted set of troops that with a bit of thought should paint up to a very acceptable standard. Highs: A good set of troops to crew your 17pdr. Lows: Insufficient single ammo pouches and uniform decals, and some of the detail could have been just a bit sharper. This being Bronco's first foray into action poised figures this would seem to be a very good effort. Thank you Alan for the review.